Have you ever woken up before your alarm goes off and wondered what time it is? Too tired to even turn your head and look at the clock? Now with 'Wake Up Now?' all you have to do is grunt, clap, or ask your alarm clock what time it is, and it will tell you.. literally! Simply set the Wake Up Now? 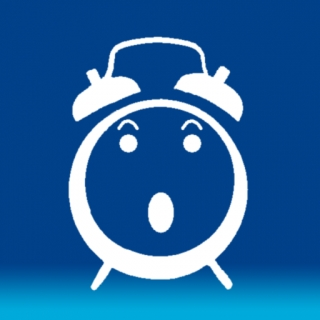 Alarm Clock, and whenever you make a loud noise you will hear the current time and the time left till you have to wake up! You will find having such easy and immediate access to the time will help you sleep sounder and with less interruptions. If want to get up at 8 AM and that first ray of sunlight disrupts your sleep at 6 AM, you'll no longer get anxious wondering if you must get up soon -- sigh a groggy, "Time? ", and you'll instantly know you have 2 more hours to rest. Should you happen to break from your slumber at 7:45 AM however, just yawn and you'll know it's only 15 minutes till the alarm. Don't fall back asleep just to be jolted right back up -- Wake Up Now and save 15 minutes of your life! Use songs from your music library or one of the many provided tones to wake you up. It's never been easier to tell if it's time to Wake Up Now!